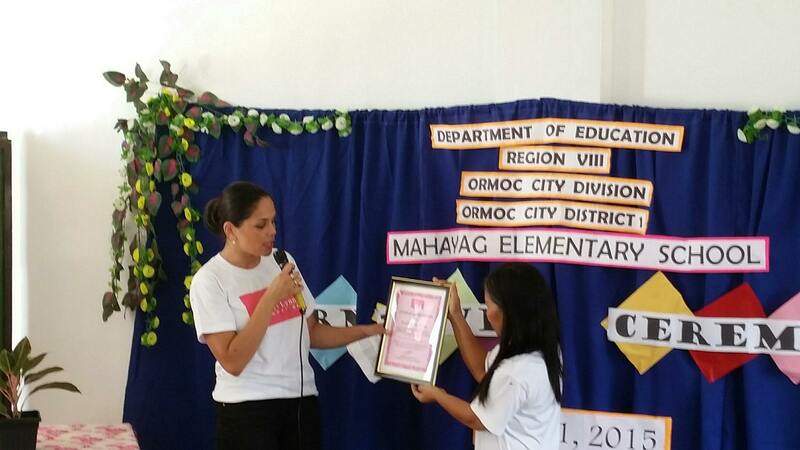 The Certificate of Appreciation was handed over during the Pagpapasalamat (thanksgiving) Ceremony by the Schools Division Superintendent, Mariza S. Magan, to our representative in Ormoc, Josefa R. Pizon, from the Rural Development Institute (RDI). SLF and RDI worked together closely in setting up several rehabilitation projects in the Ormoc area. Therefore, many thanks goes out to RDI as well, especially to Mrs. Pizon, for managing all projects. 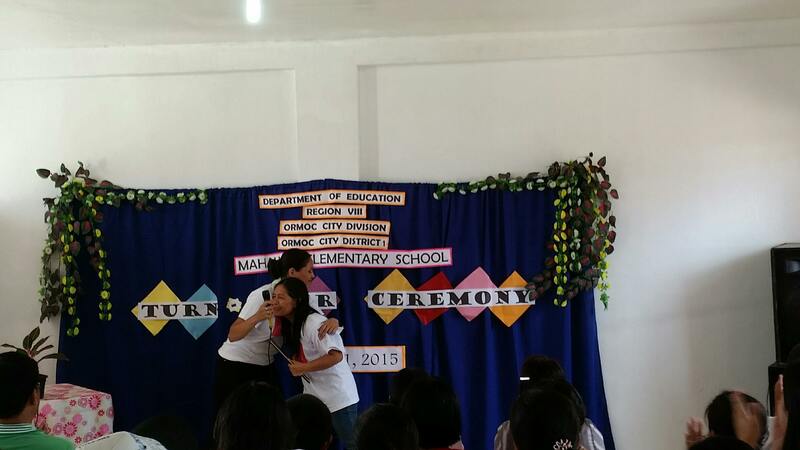 During the Official Turn-over Ceremony of the new school building for Mahayag Elementary School, a Certificate of Appreciation was awarded to Mrs. Pizon as well (see bottom photos). 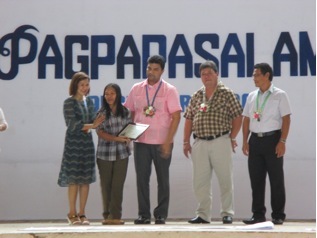 "Certificate of Appreciation awarded to the Sheryl Lynn Foundation for the invaluable assistance and support extended to the schools as a response to the aftermath of Syper Typhoon Yolanda (Haiyan)"
Photos below were taken during the Pagpapasalamat celebration, with on stage (left to right): Maria S. Magan, Josefa R. Pizon, Hon. Vince Rama, Hon. Tommy Serafica and Hon. 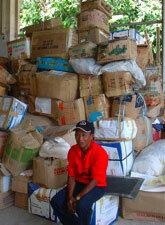 Godi Ebcas. The three gentlemen are the City Councilors of Ormoc. 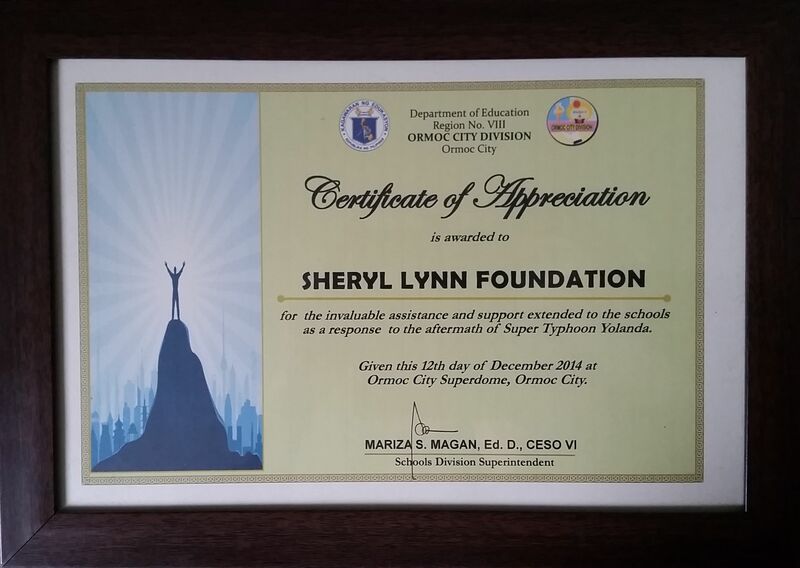 During another event (shown below) Mrs. Pizon, known to us as 'Ate Inday', was taken by surprise and humbled by the Certificate of Appreciation she received from the Sheryl Lynn Foundation. 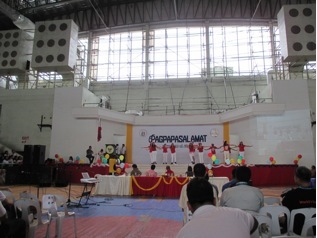 This took place during the Official Turn-over Ceremony of the new school building for Mahayag Elementary School. Ate Inday and her team at the Rural Development Institute have overseen and executed this rehabilitation project on behalf of the Sheryl Lynn Foundation and we are extremely grateful for it!